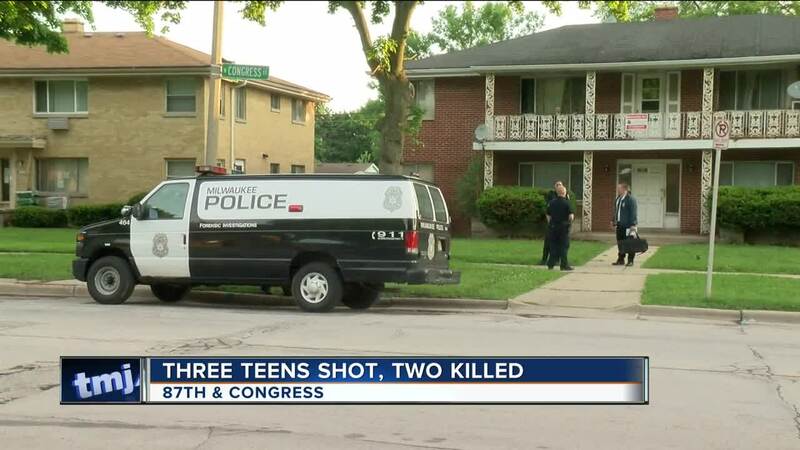 MILWAUKEE – Two teens are dead and one is wounded after a Sunday night triple shooting on Milwaukee's northwest side. It happened just after 9:30 p.m. near the intersection of 87th and Congress. "It was right behind my apartment building," Quality Kyle, a neighbor said. "I had my son here. We were scared out of my mind." According to Milwaukee Police, 16-year-old Dejah J. Adkins and 19-year-old Frank L. Cardona sustained serious gunshot wounds and passed away at the scene after emergency officials tried to revive them. The third teen, a 17-year-old boy, was located approximately four blocks away with a non-life threatening gunshot wound and was transported to a local hospital. "I came outside to help my fiancee because she brought food home. We heard two quick boom, booms," Nick Uihlein, another neighbor said. "We're like, neighbors are shooting off fireworks. We didn't think anything of it. Went upstairs and 10 to 15 minutes later, we saw the whole block was shutdown." "I heard guys talking and then, maybe five minutes later, heard gunshots," Kyle said. "Then I heard a lady screaming. Then I heard another gunshot and the screaming stopped." "That's freaky," Marcus Hardwick, another neighbor said. "It comes down to killing each other right here. Right in my backyard." Hardwick says he has four children, including his oldest at 13. He says his son is out around the house all the time, though he's second guessing letting him out after sun down. But that won't be the biggest change in his household. He says he's now going to carry his handgun with him always. "I will probably be carrying it all the time now," Hardwick said. "I normally park back there where the girl got shot. Nearly in the same spot. That's kind of creepy." Even early Monday morning, Hardwick had his handgun on his hip. He says he always teaches respect for firearms and kids need to understand how powerful they can be. "It's not a game," Hardwick said. "It's not a toy. You don't pull out a gun on anybody. You don't shoot anybody unless your life is really in danger. It's really serious. There are real consequences. Someone lost kids behind whatever the situation is." The circumstances regarding what occurred are still being investigated by district officers and detectives from Milwaukee Police’s homicide division.